Leadplayer: Nice and easy start to my first country session! Lyle: My favorite part of this rhythm riff is the last two notes. Lyle: Try playing along with me using the looping jam track once you have learned the chord changes, the alternating bass notes and the little walking bass lines. Remember, the rhythm guitar parts are the most important part of playing songs in any style. Get them down strong so you can play them consistently with the jam tracks. Lyle: Playing lead guitar is what seems to impress everyone so let's learn some riffs! Since you're using the three chords in E, you want to be familiar with the major pentatonic scales for each chord in the progression. 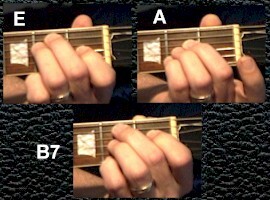 Lyle: Use your 1st and 3rd fingers for these scale patterns. Whatever is most comfortable for you. Lyle: The Major Pentatonic scale is made from the 1, 2, 3, 5, and 6 tones of the major scale. Lyle: Now try this solo which is made from those scales. You can loop the tab and even slow it down if you want. Lyle: What you're doing here with the long descending riff is playing two notes together in harmony. They are called "thirds". Notice I add a little bit of riff 2 near the end of solo 3. Lyle: The next solo is a variation of solo 3. It's not really for beginners because it's fast, but I thought I'd show it to you anyway. It has the same descending riff, just played a lot faster! gord: Solo 3 is only roots and 3rds? Lyle: Yes, some are major thirds, some are minor thirds. Lyle: Remember you can loop and slow down the tab to make it easier to learn and to play along with. Lyle: I just threw in that solo 4 in as an example of something you could work up to if you wanted. Lyle: Here's some other riffs I put together using the major pentatonic positions. Lyle: Bend just the 3rd string up a whole step. Lyle: That about it for this lesson. Lyle: You should at least learn rhythm part perfectly. Then learn the scales and solo 1 as best you can. all the other stuff is extra credit stuff!